Goldman was sixty-seven years old when the Spanish Civil War erupted in July of 1936. It was less than a month after the tragic suicide of Alexander Berkman, her closest comrade and "chum of a life-time." The promise of an anarchist revolution in Spain revived Goldman's broken spirit. Despite her advanced age, Emma hurled herself into the Spanish cause with an enthusiasm reminiscent of her early activist years in America. Goldman thought the Spanish Civil War was not only crucial to the international struggle against fascism, but also a great moment in the history of Spain and the world. It was in her view the only peasant and working-class revolution ever to be inspired by anarchist ideals. Building on more than a half-century of agitation and organization, the Spanish anarchists by the mid-1930's had won popular support in parts of Spain--with Catalonia their strongest base. When Emma visited collectivized towns and farms in Aragon in 1936 and the Levante in 1937, she was electrified by what seemed to her to be the beginnings of a Spanish anarchist revolution. 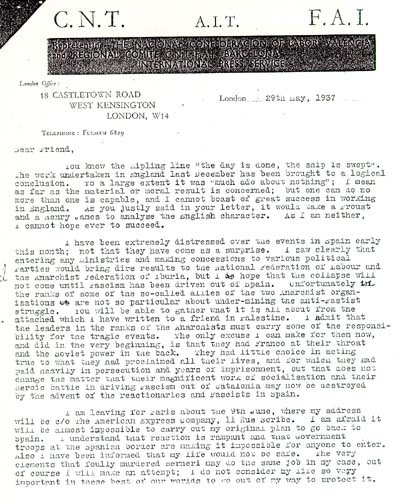 In 1936, the Spanish comrades asked Goldman to direct their English propaganda campaign, designating her the London representative of the National Confederation of Labor and the Iberian Anarchist Federation (CNT-FAI). She worked tirelessly, writing hundreds of letters to supporters and editors in the English-speaking world. 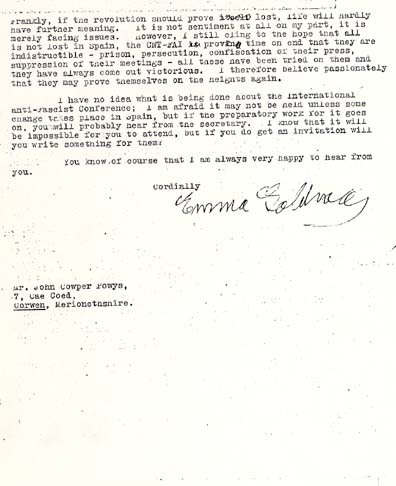 Dismayed but not vanquished by Franco's triumph in early 1939, Goldman moved to Canada, where she devoted the last year of her life to securing political asylum and financial support for the women and children refugees of the Spanish war and to publicizing legislative dangers to free speech in Canada. Emma Goldman died in Toronto on May 14, 1940. After her death, the United States Immigration and Naturalization Service allowed Goldman's body to be re-admitted to the United States. She was buried in Chicago's Waldheim Cemetery, near the Haymarket anarchists who so inspired her. A tribute to Emma Goldman's lifelong dedication to the struggle for liberty around the world and an appreciation of her personal commitment to the Spanish antifascist cause. 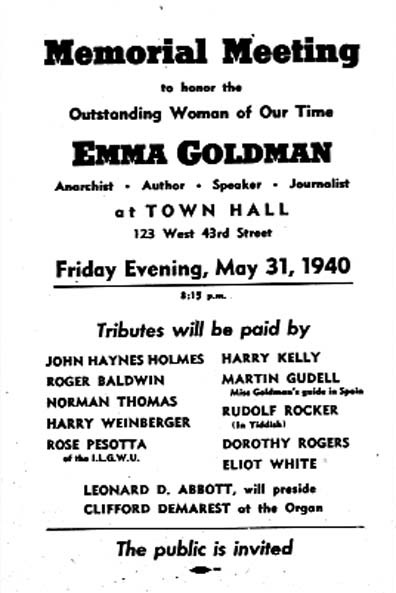 During the Spanish civil war, Emma Goldman helped lead the international campaign to support the Loyalists in their battle against General Franco and the Spanish rebels. The factional struggles between liberals, communists, and anarchists in the Loyalist coalition frustrated Goldman. She was particularly discouraged by the compromises that the Spanish anarchists were forced to make as part of their participation in the popular front against the rebels, who were supported by Germany and Italy. Honoring the Memory of "The Outstanding Woman of Our Time"
Goldman spent her last years in Canada, close enough to be visited by old friends and comrades in the United States. A ceaseless activist, she took on the task of publicizing the dangers of the War Measures Act to freedom of speech in Canada. In February 1940 Goldman suffered a stroke which left her unable to speak. By May 14, l940, the great orator and activist was dead. A memorial meeting held at Town Hall in New York followed her funeral in Chicago. Here, some of the most prominent reformers and radicals of the age paid tribute to Emma Goldman and her life's work, proclaiming her an inspiration to future generations of progressive activists. Thousands of mourners flocked to see Emma Goldman's flowerladen casket draped with the flag of the Spanish CNT-FAI (the Spanish Anarchist Federation and Trade Union). Tributes poured in from every corner of the world. At the funeral, Goldman's lawyer and friend, Harry Weinberger, welcomed her back to America, "where you wanted to end your days with friends and comrades. We had hoped to welcome you back in life--but we welcome you back in death. You will live forever in the hearts of your friends and the story of your life will live as long as the stories are told of women and men of courage and idealism." 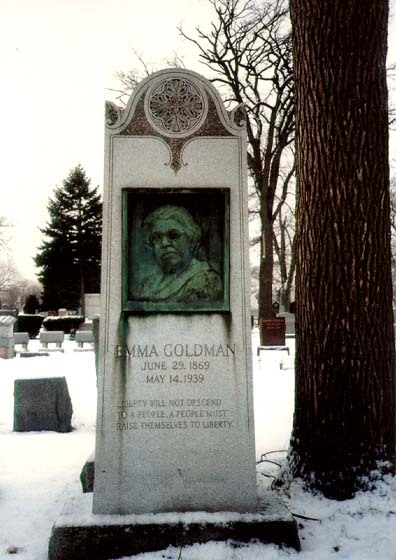 So many years passed before funds could be raised for Goldman's tombstone that it recorded the date of her birth and the year of her death inaccurately. Her spirit was captured, nevertheless, by a bas relief of Emma's face by the sculptor Jo Davidson, with her own proclamation, "Liberty will not descend to a People. A People must raise themselves to Liberty."